The enormous, cosmopolitan genus Agrilus (family Buprestidae – commonly called jewel beetles or metallic woodboring beetles) contains nearly 4,000 described species (Bellamy 2008). With many more still awaiting description, it is perhaps the largest genus in the entire animal kingdom (Bellamy 2003). Agrilus species are primarily twig and branch borers, utilizing recently dead wood for larval development – although there are notable exceptions, e.g. Agrilus anxius (bronze birch borer), A. bilineatus (twolined chestnut borer), and A. planipennis (emerald ash borer), which attack the trunks of living trees and, thus, are of significant economic importance in forest and ornamental landscapes. Host specificity among Agrilus species ranges from highly monophagous – associated exclusively with a single plant species – to rather oliphagous – utilizing several, usually related, plant genera. Adults of Agrilus species are most often found on the foliage of their larval hosts and do not generally visit flowers, as is common in some other genera (e.g., Acmaeodera and Anthaxia). Interestingly, despite the diversity and worldwide distribution of the genus, no species of Agrilus are known to be associated with coniferous plants – a fact that has limited their expansion into the vast northern boreal forests. As can be imagined by its enormity, a comprehensive understanding of the genus will remain a distant goal for many years. Progress will come incrementally, as formal descriptions of new species gradually improve our knowledge of the fauna that exists in each of the world’s main biogeographic provinces. In a recent issue of the online journal Zootaxa, Dr. Henry Hespenheide (UCLA) describes two new species of Agrilus from Mexico. These two species are interesting because of their association with ‘mistletoe’ plants in the genus Phoradendron (family Viscaceae1), obligate hemiparasites that attach to branches and stems of various woody trees and shrubs in tropical and warm temperate regions of the New World. Plants in this genus are known to support a variety of host-restricted insect herbivores, principally in the orders Hemiptera, Coleoptera and Lepidoptera. 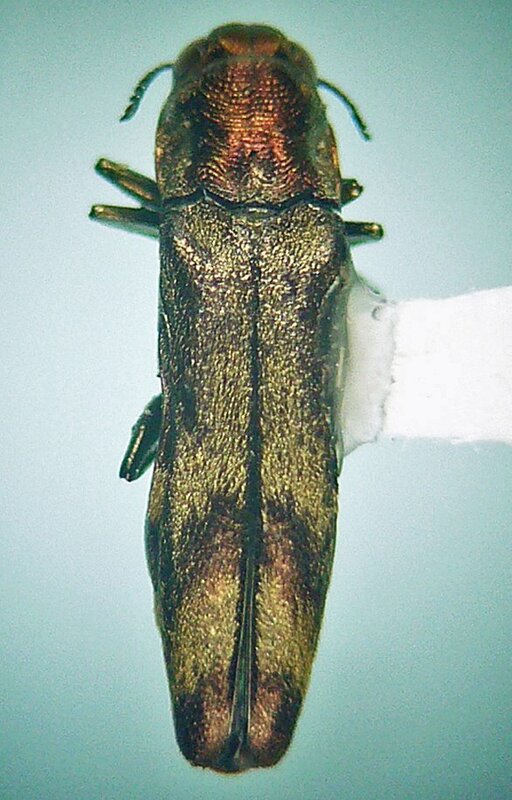 A single buprestid species has been associated with Phoradendron to this point – Agrilus turnbowi, recently described from specimens reared from dead stems of Phoradendron tomentosum attached to mesquite (Prosopis glandulosa) in southern Texas (Nelson 1990) and pictured here from a specimen in my collection that was reared from dead mistletoe collected at the type locality. At the time of its description, this species was not relatable to any of the other known species in the genus. 1 The Angiosperm Phylogeny Group (2003) includes the Viscaceae in a broader circumscription of the family Santalaceae. However, recent molecular studies suggest the Santalaceae are polyphyletic, with strong support for Viscaceae as a distinct, monophyletic clade (Der & Nickrent 2008). The two new Mexican species – A. andersoni from Guerrero and Puebla (Figs. 1-3), and A. howdenorum from Oaxaca (Figs. 4-6) – are apparently related to A. turnbowi, which they resemble by their purplish-red coloration and complex pattern of golden setae on the elytra. They are also superficially very similar to each other but differ most notably in size and the overall color and pattern of setae on the elytra. Figures 1–3. Agrilus andersoni Hespenheide: 1. dorsal habitus; 2. lateral habitus (scale bar indicates 2.0 mm); 3. genitalia of male (scale bar indicates 0.5 mm) (from Hespenheide 2008). Figures 4–6. 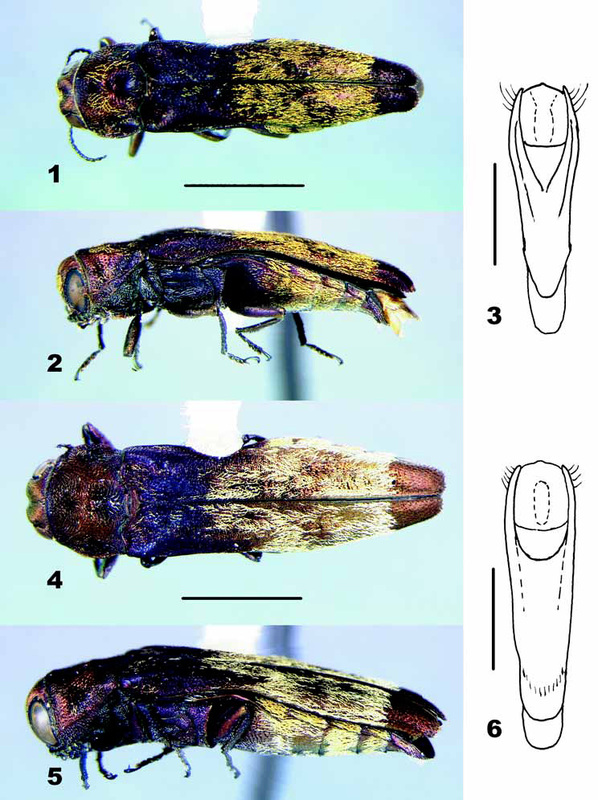 Agrilus howdenorum Hespenheide: 4. dorsal habitus; 5. lateral habitus (scale bar indicates 2.0 mm); 6. genitalia of male (scale bar indicates 0.5 mm) (from Hespenheide 2008). Hespenheide speculates that the color and pattern of the golden setae on the elytra may serve to make the beetles less conspicuous by disruptive coloration, noting the similar coloration of the setae to the leaves of Phoradendron as seen in the photograph of Agrilus howdenorum on its host plant (Fig. 7). This form of crypsis may also be enhanced by the purplish-red ground coloration of the adult, which resembles that of the small, darkened blemishes often observed on the foliage of these plants. Figure 7. Agrilus howdenorum adult on mistletoe host plant near Diaz Ordaz, Oaxaca, México. The golden setae on the elytra are similar in color to the leaves of the mistletoe and may function as a disruptive color pattern. Photograph by C.L. Bellamy (from Hespenheide 2008). Bellamy, C. L. 2008. A World Catalogue and Bibliography of the Jewel Beetles (Coleoptera: Buprestoidea), Volume 4: Agrilinae: Agrilina through Trachyini. Pensoft Series Faunistica No. 79, 722 pp. This entry was posted in Buprestidae, Coleoptera, Viscaceae and tagged beetles, crypsis, entomology, insects, jewel beetles, literature, Mexico, nature, new species, parasitic plants, predator avoidance, science, taxonomy. Bookmark the permalink. Thank god this genus doesn’t like conifers. It’s bad enough that we have southern pine beetles here. I can’t imagine thousands of different genus eating our pines. Not to worry – the vast majority of species in this genus breed strictly in already dead branches. The few pest species in the genus have been made so by man – emerald ash borer is exotic, bronze birch borer causes most of its damage on the exotic European birch, and two-lined chestnut borer primarily hits trees already suffering other biotic and abiotic stress factors. Besides there are numerous buprestid species in other genera (esp. Chrysobothris) that are fond of pine and other gymnosperms. Found you via Gossamer Tapestry. Fortunately for me I’m only familiar with the Emerald Ash Borer…and that’s plenty for now!